In a year that celebrates the 10th anniversary of the S.H. Figuarts toyline, Tamashii Nations is also helping to celebrate the 50th anniversary of the classic series Ultra Seven! In honor of this, Bandai has recently released S.H. Figuarts Dan Moroboshi, the civilian identity of the gigantic hero Ultra Seven! Dan, is the first in a series of new civilian identity S.H. Figuarts, that’s already been followed by Retsu Ichijoji as well as Takeshi Hongo. This release sets a sort of new standard for what to expect, and for where improvements can be made to this type of release as well. The biggest thing I notice with this figure, is that Bandai has massively stepped up their face printing technology, and the figure has a true to life sculpt & paint job. Dan looks like he jumped right off the screen. Dan also includes a fantastic array of accessory giving him a full compliment Ultra Garrison items and his Ultra Seven transformation device, the Ultra Eye! We’ve attached the full 50 image gallery to this post, but you can also check out our in-depth review of S.H. Figuarts Dan Moroboshi after the jump by clicking “Discuss on the TokuNation Forums” at the bottom of this post. We’ll be back next week with more new galleries for Toku Toy Box! In a surprising bit of news this month’s Figure Oh scans have revealed a previously unknown figuart from the Ultraman franchise. None other than S.H. Figuarts Dan Moroboshi! The human form of Ultra Seven, Dan is looking pretty magnificent in figure form. Recreated here in his signature Ultra Garrison uniform, Dan is looking pretty sharp. 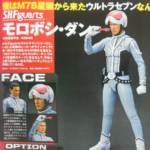 He includes an alternate helmetless head, the Ultra Eye transformation device, and the Ultra Gun, as well as presumably several sets of hands. Dan is set for an October release, seemingly at retail, for 6264 yen. We’ll update this story as more information becomes available. The biggest question raised by this surprise reveal though, what does this mean for the prototypes of Retsu Ichijouji (Gavan) & Takeshi Hongo (Rider 1) that we’ve seen previously? Let’s hope it’s something good.